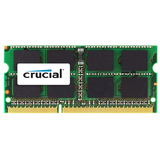 Increase the speed of your Mac and install the Crucial CT4G3S1067M 2GB Mac Memory Module. Today?s newest programs require more power and speed to stay productive. The Crucial CT4G3S1067M 4GB Mac Memory Module adds 4GB of DDR3 memory to your Mac, increasing your system?s ability to multitask and run demanding applications for photo editing, video editing, music production and more. Designed with a 204-pin SODIMM interface, it?s an easy-to-install, easy-to-enjoy upgrade for your Mac; install more than one of these modules to give your computer a high-speed makeover. Boost your performance today with the Crucial CT4G3S1067M 2GB Mac Memory Module.